Indonesia has reported a second straight year of declining deforestation, and credited more stringent land management policies for the trend. However, the government’s insistence on counting pulpwood plantations as reforested areas has once again sparked controversy over how the very concept of a forest should be defined. Researchers caution that the disparity between Indonesia’s methodology and the standard more commonly used elsewhere could make it difficult for the government to qualify for funding to mitigate carbon emissions from deforestation. JAKARTA — The Indonesian government has reported a second straight annual decline in the country’s deforestation rate, but continues to confound with its definition of what constitutes a forest. The Ministry of Environment and Forestry recorded 4,790 square kilometers (1,850 square miles) of deforestation in 2017. That’s down 24 percent from the 2016 figure, which in turn represented a 42 percent reduction from 2015, when record-breaking fires contributed to a total of 10,900 square kilometers (4,210 square miles) of deforestation across the archipelago. Of the total deforestation that occurred last year, 3,080 square kilometers (1,190 square miles) were recorded in forest areas, while the rest were in “other-use areas,” known as APL and which include oil palm plantations and infrastructure development sites. Intact forest cover was recorded at 936,000 square kilometers, or about 361,400 square miles — an area nearly the size of California’s land mass. An illegally logged tree in Central Kalimantan, Indonesian Borneo. Habitat loss played a critical role in reducing rhino populations, but most experts now believe the species’ low birth rate is a more pressing problem. Photo by Rhett A. Butler/Mongabay. Environment and Forestry Minister Siti Nurbaya Bakar credited the decline to “efforts from multiple policies” being put in place. In particular she pointed to so-called production forests, which are typically leased for pulpwood and timber plantations. “There has been a decline in deforestation in production forests, from 63 percent [of total deforestation] in 2014 to 44 percent in 2017,” she said. However, the role of production forests, and the industrial plantations they cover, in deforestation assessments has always been a contentious issue in Indonesia. Researchers and conservation think tanks, such as the World Resources Institute (WRI), define deforestation as the conversion of natural forest cover to other land-cover categories. That means the clearing of forest for the cultivation of industrial plantations — acacia and eucalyptus for pulpwood, for instance — automatically counts as deforestation. The Indonesian government, on the other hand, doesn’t take that view. It counts forest loss in primary forest, secondary forest and man-made plantations, including industrial plantations that are established to produce a high volume of timber in a short period of time. That means industrial plantations are not perceived as non-forested areas once the areas are replanted with acacia and eucalyptus trees, according to the ministry’s official in charge of gathering forest-cover data, Ruandha Agung Suhardiman. “Planting in industrial forest areas is considered reforestation,” he said. It’s a distinction heavy on semantics: the government defines deforestation as the “permanent alteration from forested area into a non-forested area as a result of human activities,” per a 2009 decree from the forestry minister. Industrial plantations, because of their cycles of planting and harvesting, are seen as not causing “permanent alteration” to the forest cover. An orangutan in a forest in North Sumatra. 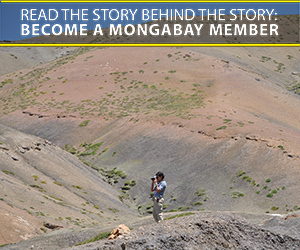 Photo by Rhett Butler/Mongabay. That difference in definitions has led to stark disparities in how deforestation is reported in Indonesia. A 2014 study led by researchers at UMD found that Indonesia’s deforestation rate had surpassed that of Brazil, giving the archipelago the dubious distinction of having the highest deforestation rate in the world. According to the study, Indonesia lost 8,400 square kilometers (3,240 square miles) of natural, or primary, forest in 2012, while Brazil’s deforestation rate at the time stood at 4,600 square kilometers (1,780 square miles). However, the official deforestation figure from Indonesia’s forestry ministry that year was significantly smaller, at 6,100 square kilometers (2,360 square miles). The WRI, whose Global Forest Watch is the first tool of its kind to monitor global forests on a monthly basis, says it’s important to address this difference. 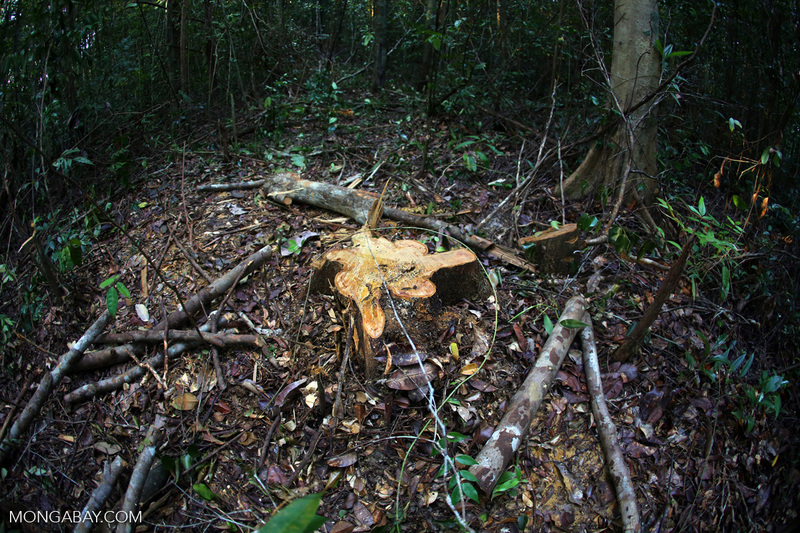 The WRI, a Washington-based think tank with an office in Indonesia, has cautioned that the disparity may hamper Indonesia’s bid to seek foreign funding to support its initiatives to reduce emissions from deforestation and forest degradation under a scheme called REDD+: without a universally agreed-on definition of deforestation, it might be difficult for Indonesia to cite its own data to claim funding. Minister Siti, though, dismissed the controversy over the definition as part of a conspiracy to paint Indonesia’s forestry sector in a negative light. She said deforestation did not always have to have a negative connotation, for instance when it leads to economic development. Siti added that the concept of “zero deforestation” should not apply to a developing country such as Indonesia. A graph showing Indonesia’s deforestation trend based on the Ministry of Environment and Forestry’s data since 1996. Graphic courtesy of the Ministry of Environment and Forestry. Siti acknowledged the decline in recent years, but cautioned that the trend “is not a given.” Indeed, deforestation in APL areas — driven largely by oil palm plantations — rose to nearly 36 percent of total deforestation, up from 24 percent in 2014. One of the consequences of this proliferation of oil palm plantations has been the destruction of forests that are home to critically endangered species such as orangutans. The problem came into gruesome focus earlier this year with the discovery in Central Kalimantan province of an orangutan that had been decapitated and shot multiple times, in an area bordered by five oil palm plantations. Siti said she was aware of the case and was particularly concerned, noting that more than 200 oil palm plantations were currently operating in orangutan habitat, accounting for a fifth of the 20,000 square kilometers (7,720 square miles) of palm plantation area in Central Kalimantan. 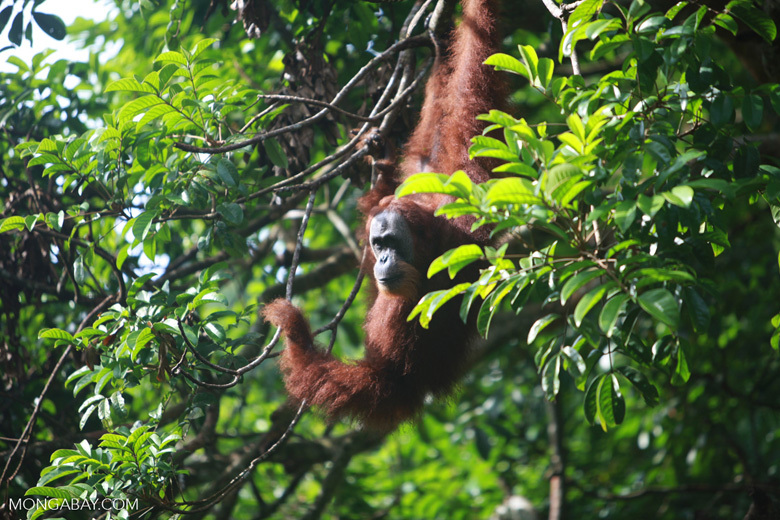 Operators of oil palm plantations often consider orangutans a pest because they are known to eat the palm fruit. A 2005 study by the conservation NGO Friends of the Earth found that one such company in Central Kalimantan province would pay local people 150,000 rupiah (about $10) for every orangutan killed. Another trend highlighted in the 2017 data is the increase in deforestation in protected and conservation areas, amounting to 20 percent of the total, up from 12 percent in 2014. For Siti, that’s a move “in the right direction,” because it means policies aimed at agrarian reform and empowerment are working. Those policies, under the government’s “social forestry” program, entail moving people out of production forests and into protected and conservation areas, where deforestation can be more stringently controlled. Another government program also yielded good results last year — namely, the packet of policies aimed at preventing forest and land fires, particularly in peat areas. The devastating fires of 2015 scorched 26,100 square kilometers (10,080 square miles) of land; blanketed vast swaths of the country in a haze that sickened half a million Indonesians; sparked a diplomatic row with Singapore and Malaysia; and, at its peak, generated daily carbon dioxide emissions that exceeded those from all U.S. economic activity. In 2016, a string of regulations to better protect peatlands was rolled out, and the incidence of fires decreased. In 2017, the area burned was down to 1,654 square kilometers (640 square miles). 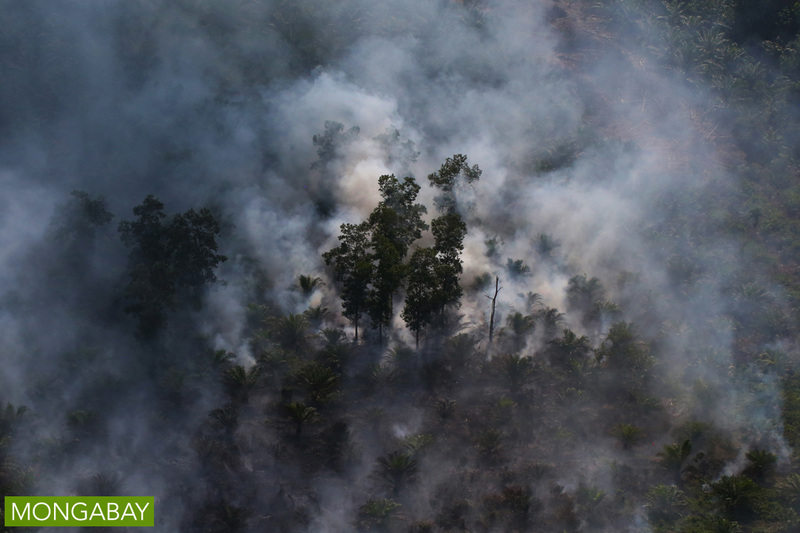 “What’s important is to keep mitigating fires and preventing fires on peatlands,” Siti said. Banner image: Buttress roots of a rainforest tree in Sulawesi, Indonesia. Photo by Rhett A. Butler.